Assembling Consumption marks a definitive step in the institutionalisation of qualitative business research. By gathering leading scholars and educators who study markets, marketing and consumption through the lenses of philosophy, sociology and anthropology, this book clarifies and applies the investigative tools offered by assemblage theory, actor-network theory and non-representational theory. Robin Canniford is Co-director of the Cluster for the study of Organisation, Society and Markets (COSM) at the University of Melbourne, Australia. His research applies ethnographic methods to trace the market-mediated intersections of discursive environments and consumer subjectivity. He is particularly interested in the intersections of ‘nature’ and markets. His work has appeared in Marketing Theory, the Journal of Consumer Research and the European Journal of Marketing. Domen Bajde is Associate Professor at the University of Southern Denmark. His research explores the intersection of pro-social action and markets, giving and charitable behaviour and online consumer behaviour. His recent research combines different socio-cultural perspectives to explore the ideological and socio-material aspects of practices occurring at the intersection of gift and market. His work has been published in Consumption, Markets and Culture, Marketing Theory and Behaviour and Information Technology. 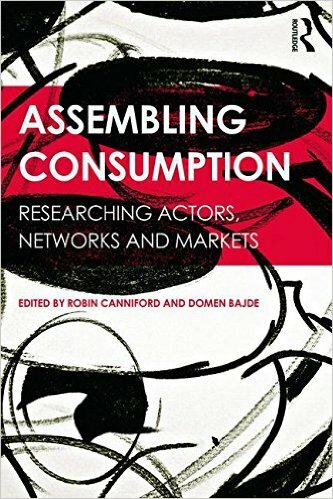 "Assembling Consumption is the definitive guide to understanding how the assemblage concept can bring new insights to understandings of consumer culture. Canniford and Badje gather leading scholars working in this area to demonstrate methodological and empirical applications of these emerging theories. If you are considering using an assemblage approach, or simply want to remain on the cutting edge of consumer-culture research techniques, this volume is a must-read." "Researchers, assemble yourselves! In this handy, useful guide, you (and you!) will find assemblage and actor-network theories composed such that their edifying value can be assessed, not tamed. Assembling Consumption affords the novice transformational entrée through impassioned texts that invite a re-doing and re-expression of the territories occupied by "consumer" and "market(ing)" in an epoch of heterogeneous, emergent networks, compression and instantaneity."